An analysis of national survey data indicates that laws legalizing medical marijuana use are associated with increases in illicit cannabis use and cannabis use disorders among adults. The research was funded by the National Institute on Drug Abuse (NIDA) and the National Institute on Alcohol Abuse and Alcoholism (NIAAA), both part of the National Institutes of Health. Comparing overall trends in states with medical marijuana laws to states without these laws, the authors examined data from three NIAAA-supported surveys conducted in 1991-1992, 2001-2002, and 2012-2013. In addition, the definition of cannabis use disorder was based upon the DSM-IV definition of cannabis abuse or dependence in the past 12 months. The authors estimate that an additional 1.1 million adult illicit cannabis users and an additional 500,000 adults with a DSM-IV cannabis disorder may be attributable to medical marijuana law passage. However, investigators also note there could be other contributing factors. These findings underscore the importance of examining how more permissive state marijuana laws can increase the risk of cannabis-related health consequences. An accompanying commentary on the article by NIDA scientists highlights the potential negative effects of cannabis on mental health. For a copy of the paper — “U.S. Adult Illicit Cannabis Use, Cannabis Use Disorder, and Medical Marijuana Laws: 1991-1992 to 2012-2013”— published in JAMA Psychiatry, Go to http://jamanetwork.com/journals/jamapsychiatry/fullarticle/2619522. For a commentary on the article — “Medical Marijuana Laws and Cannabis Use: Intersections of Health and Policy”—authored by NIDA’s Wilson Compton, M.D., Nora Volkow, M.D., and Marsha Lopez, Ph.D., go to: http://jamanetwork.com/journals/jamapsychiatry/fullarticle/2619521. 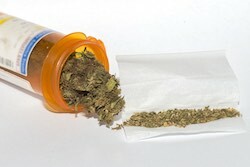 For information about marijuana use, go to: https://www.drugabuse.gov/publications/drugfacts/marijuana. NIDA. "Illicit cannabis use and use disorders increase in states with medical marijuana laws." National Institute on Drug Abuse, 26 Apr. 2017, https://www.drugabuse.gov/news-events/news-releases/2017/04/illicit-cannabis-use-use-disorders-increase-in-states-medical-marijuana-laws. NIDA. Illicit cannabis use and use disorders increase in states with medical marijuana laws. National Institute on Drug Abuse website. https://www.drugabuse.gov/news-events/news-releases/2017/04/illicit-cannabis-use-use-disorders-increase-in-states-medical-marijuana-laws. April 26, 2017.